Teferi learns it's hard to sway a Keldon who's made up her mind. Radha hadn't gone deeper into the forest like Teferi had assumed. The way out the valley was up the mountain, and up the mountain was Greht. She needs to kill him. But how? He's too strong for her. His host is too large. 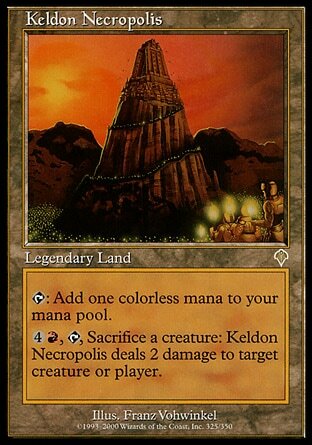 The larger his army the stronger he becomes, which leads to more victories and successful raids, which leads to more Keldons joining his warhost, which just makes him even stronger. She needs to either remove his army from him or gain an army of her own. 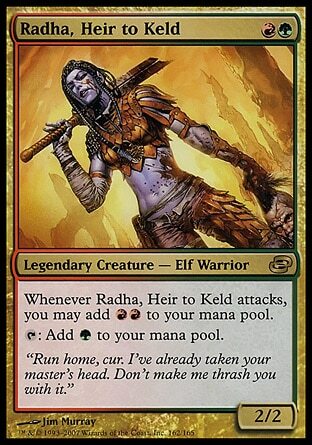 Only a warlord can lead a 'host, and you are no warlord, Radha. The planeswalker's mental voice is startling, but it doesn't slow her down. And what does he know anyway? He tries to reinforce her doubts, that her task is foolish and she must serve Skyshroud, but he's wrong. She's Keldon to her core. Teferi changes tactics. He tells her that she's special, and that he has need of her, but knows that she needs to finally leave home to see the true Keld for herself. He can help her. He has the ability to put everything she's been striving for within her reach, and should she choose that path, all she has to do is call out his name and he'll be there for her. With the pesky wizard gone, Radha gets back to business to tracking down the warlord. It might take days before she finds his mobile encampment, but she'll find it. Leaving the valley will be a direct violation of Feyalise's commands, but it will be worth it. Radha lays her eyes for the first time on a human encampment, and it is clear that Greht's party has passed through here. Amidst the bodies in the street, she gives a crying, blinded boy one of her tear-shaped blades and some food. She knows he's afraid, but the Gathan will return, and they'll stare and laugh at him. When they do one of them will get close, as close as she is now to him, and when that happens, all he has to do is jam the blade forward and up, making sure to put his legs in it. Then he can have some revenge. After giving the boy what advice she can she's smacked solidly in the face as she rounds a corner. two humans begin attacking her, then a third, and then more. They demand to know what she wants and why can't she leave them alone. She's done enough already. The commotion attracts attention of even more people, and when one of them finally shows up with a sword, he takes command. Clearly these are the leftovers from raid, the ones the Gathans didn't want for themselves to increase the ranks of their army. Radha tells them she's a true Keldon, not like the people that attacked them. Those are her prey. But while the mob eventually accepts she might not be one of their attackers, it's quite clear she's talking crazy talk about being Keldon. She's one of the elves that hide away in the valley. Radha pulls out her blades ready to show them how wrong the are. All of a sudden she's lifted into the air and the terrified faces of the villages become frozen in place. Teferi asks her how she's ever going to get her own army this way. Things will be better if she allows him to show her Keld. The real Keld. I know the mountain is where Keld beings, and the Necropolis is where Keldons end. That's the Keldon way in a nutshell, isn't it? Beginnings and endings, followed by new beginnings. Every twilight is followed by anew dawn, and so long as the fire keeps burning through the darkness and the cold, Keld will endure. Do you know the tinder spell? 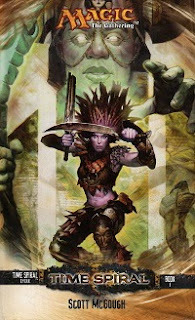 Radha keeps her mind clear, but Teferi show her he doesn't need to read her thoughts to recite the words. "Burn," Radha cried, and a sheet of emerald flames suddenly covered her from head to toe. Teferi releases his hold on her and admits that maybe she's Keldon after all. Radha looks down to sees a pile ash. The wizard extends her hand and tells her that if she wishes, he can show her more. The elf... the Keldon... fights her first instinct to just walk away and takes his hand. Oh that's right. 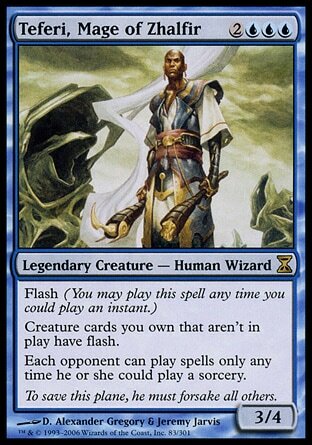 It's Radha, not Teferi. I should have realized the significance of that sooner, regardless of who is the planeswalker here, regardless of who appeared in chapter one, and regardless of who is more familiar to me. It's becoming more and more apparent that Radha is perhaps the key player of the book. It seems like this book is about Radha's journey. Radha is the young hero with a destiny she doesn't know she has and Teferi is the wise wizard to help her along her path. It's just that in this story we're viewing it more from the wizard's point of view and not the hero. We're watching the story with all the wisdom of the wizard and getting to watch all the difficulties he has to go through to make our hero to reach her full potential.